Set the stage for your dream kitchen. In all likelihood, there is an island, or at the very least, counters that go on for miles, on which you chop, dice, and mix. (You set up separate stations for each, just because you can.) There are appliances and tools ready for you at your every mixing and churning whimsy, places to bake, and then to cool, all of your latest creations. And somewhere—maybe above the stove, maybe beside it—there are likely copper pots, beautiful and shining and ready to simmer. But copper pots and pans are for more than just daydreams, for mind movies of cooking alongside Julia Child and flipping your own perfect omelette. There’s a reason these, to some, are the crème de la crème of cookware. 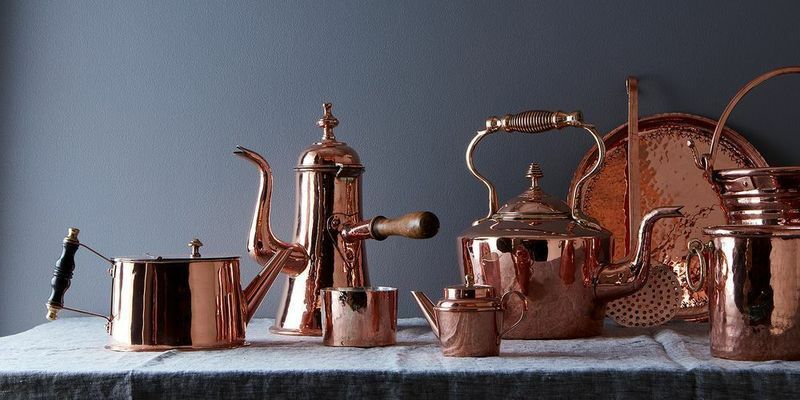 For those of you who are lucky enough to own them—or those who’d just like to treat them properly in the kitchens of their dreams—we’re talking copper. Copper doesn’t just make your stove stylish, it lends you a helping hand while you cook. As a metal, copper is one of the best conductors of heat: It warms quickly and stays warm, making for an even distribution of heat, and—here’s the best part—uniform cooking of your food. This means no more burnt spots, no more scalding. You have greater control over everything. See? Helping hand. And while we have you, a rumor we'd like to dispel: Copper is 100% safe to cook in, so long as it is lined with another, non-reactive metal (and most copper cookware is). Most commonly, you'll find linings made of nickel, tin, or stainless steel. Throw anything and everything into these pans; the metal lining will keep you—and your food—safe. An exception: There are certain kinds of copper cookware, like egg white whipping bowls and jam pans, that actually harness copper's reactive qualities to do their job more effectively—stabilizing the proteins in egg whites, and responding to to changes in temperature quickly, for extra precision while you’re cooking down your jams, respectively. For that reason, they won't be lined with a non-reactive metal, but they are safe to cook with as directed. Be nice to your copper. Trust your copper. Copper is the decathlete of metals—it’s ready to do most anything you ask of it, effortlessly. Since it’s extremely efficient with heat, there is generally no need to use a high flame, or to preheat before cooking. 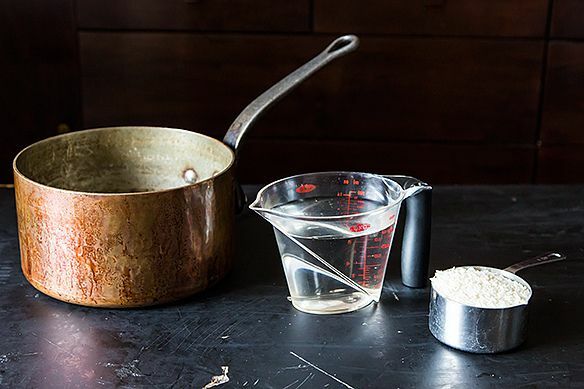 Keep your heat moderate, and let the pan do the rest of the work. If you accidentally got a little impatient with the heat and cranked the flame, discoloration could occur. If this happens, not to worry, there’ll just be a Wright’s Copper Cleaner (or Brasso) and a bit of elbow grease in your future. Not true! One of the great myths of copper cookware is that it is difficult to care for. We are dispelling that, right here and now. Copper pots are built to last—built to boil, sauté, and braise with the best of them—and come out the other side alive. Most importantly, the majority of battle scars they incur can be successfully healed with just a pantry and a little patience. 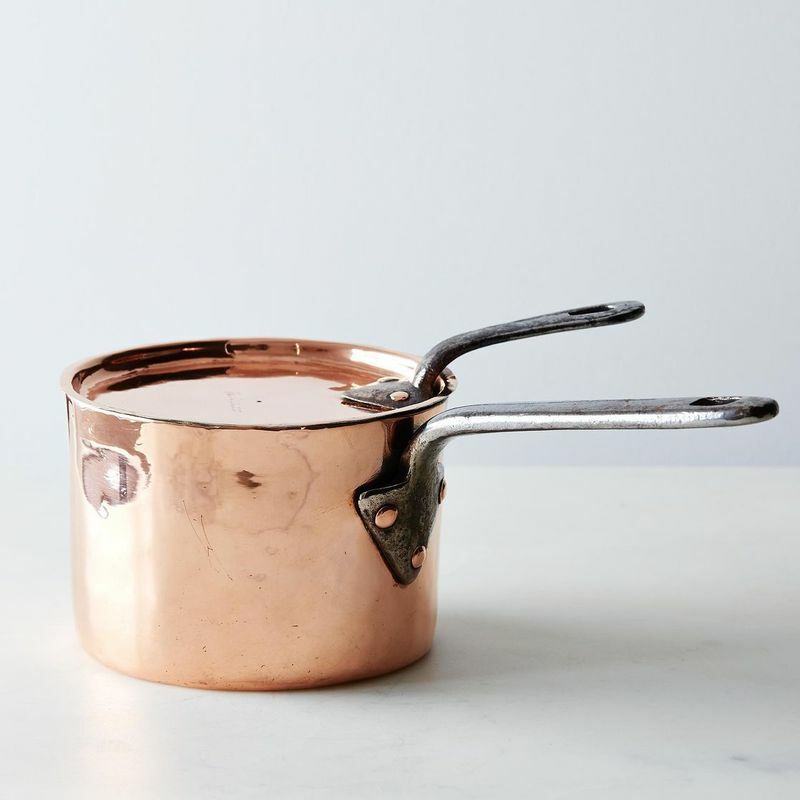 Wash and dry per usual: After cleaning with warm soap and water, be sure to dry your copper pots thoroughly. Any residual water could lead to a quicker tarnishing of the copper. You can even use baking soda: Make a potion of equal parts baking soda and lemon juice, and rub away the tarnished spots with a soft cloth. Just watch—this one is kind of like magic. Restored vintage copper treats from our Shop: Left, a 20th-Century Baking Dish; right, a mid-19th-Century English Saucepan. Polish with vinegar: We don’t recommend using your best balsamic, but a little white vinegar goes a long way with copper. Simply soak a cloth in it and rub the surface of your pot, periodically changing to a new area of your cloth, and then smile—the pot lid, now shiny beyond belief, doubles as a mirror in a pinch. Or call in the tomatoes: The acid in tomatoes works wonders on copper. Cover the surface of your pot with tomato paste, let sit for a few minutes, and then wash it off with soap and water. Or, if you don’t have tomato paste, ketchup plays pinch hitter. Rub a small amount over your pot with a rag and rinse. Unless the lining is cracked or flaking, exposing the copper underneath, a naturally worn and patinaed pan is perfectly safe to cook with. If the lining is worn through to reveal the copper underneath, do as Beth Sweeney of Coppermill Kitchen does and send it off to be professionally re-tinned. Some professionals that our readers have recommended include: East Coast Tinning, L.J. Gonzales, and Brooklyn Copper Cookware. This post originally ran in 2012 (vintage! ), but we've spruced it up (to include some additional tips, and several of yours from the comments!) and shared it anew to help anyone caring for copper cookware this season. Do you cook with copper? Share your best tips for polishing and care in the comments (and shop for it, here). Hi. We bought a copper pan from a very high end restaurant that was closing. I went to heat some water and turned on the wrong burner, heating the dry copper pan by mistake. It turned a very dark gray, which mostly wiped out with a paper towel, although some remains after washing. Is it safe to cook in? If you don't see any exposed copper it's safe. Even copper the size of a quarter showing is okay (one tinning company wouldn't even do it until more copper showed). No idea if yours is lined with tin or stainless steel, but if the lining is still there, just clean it out with Barkeepers Friend or Comet or something and carry on. taking care of you copper cookware it is easier than a lot of people think. I manufacture copper cookware, www.amorettibrothers.com, and by my experience copper is not only a beautiful living metal, which adapts and changes depending of external conditions, but it is also pretty easy to shine if you just follow a little care: salt and lemon in a bowl, mix it up, use it to clean your copper, then fresh water. That's it. My grand-mom trick it is always valid. Better than chemicals, which are always useful in case of emergency! 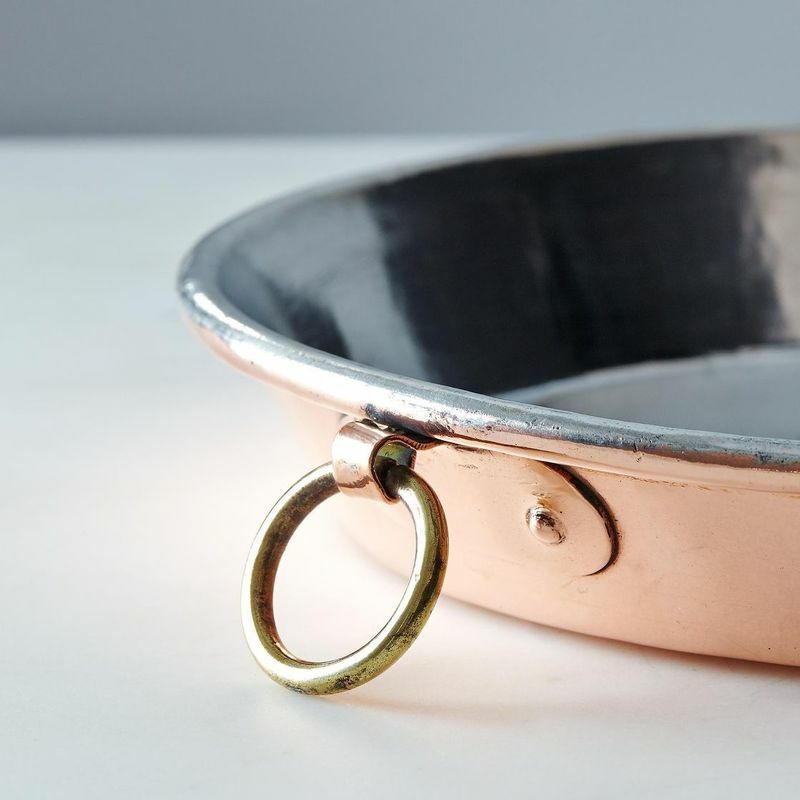 Great advice and comments on how to best clean copper cookware. After working in a cookware shop for several years and having had the pleasure to own several dozen copper pans I thought I would add to this by saying we used Bar Keepers Friend to clean copper lined with stainless and the exterior of tin lined pots. I've used lemon and salt which is great for removing oxidation but not so much for cleaning (and lemons aren't always available or cheap). If you want them shiny and polished, we used Wenol metal polish (I still have a jumbo tin I bought 15 years ago!) This works great after the Bar Keepers. I like my hammered copper polished with slight oxidation and use a large hammered roasting pan to serve oysters or salt roasted Sea Bass during the holidays. Also consider that retinning is great but can be more than the cost of the pan as its toxic and hard to find people who will still do it. The stainless lining (in French pans at least) is so thin its hard to tell the difference between that and the tinned other than ease of use. A tinned pan's lining can melt on the stove if the pan is left empty for too long under high heat. 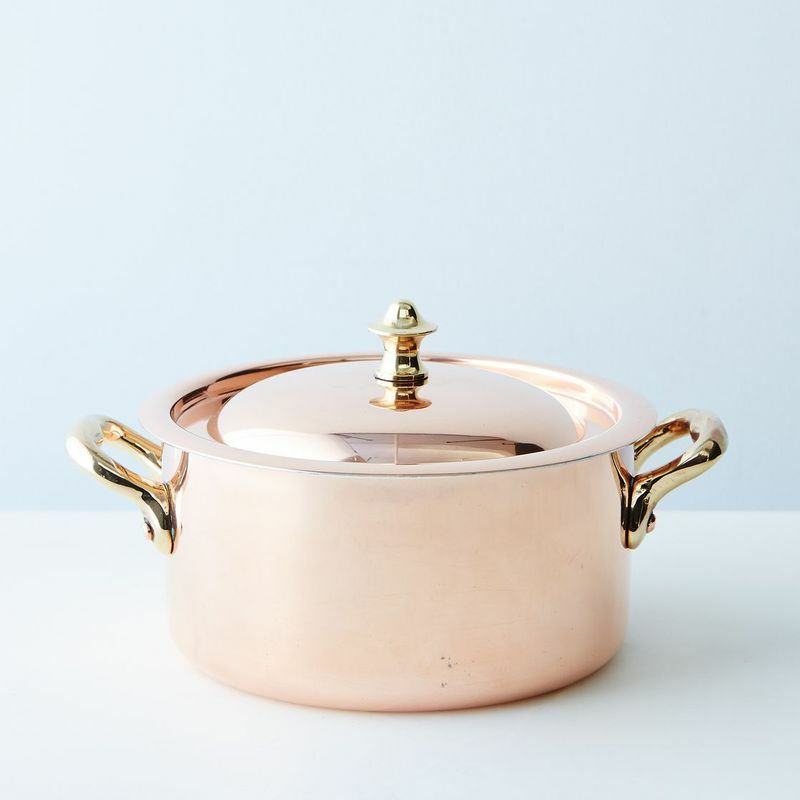 I recently purchased a copper, glass lined casserole with lid and would like to use it! Not sure if oven temp should be different from recipe or not. Thanks for a,y help. How do you care for Hard Anodized aluminum cookware? The outer surface always gets grease and no matter how hard we scrub...can never the grease out. Any tips will be appreciated. TIA! What should I do about the film on the pot before using? (the protective film..is there something one must do lst? )....I have gotten some pots and put them aside...over l0 years...waiting for "later"....now's the time. Please help..so I can begin..they are from France. I remember reading this article when it first came out and thinking, maybe, someday, I would polish my copper...nah! I'm of the school that they are beautiful with their patina of use. I use my copper everyday along side cast iron skillets and dutch oven and my enameled dutch oven. This may be obvious to some, however, the comments about cooper cooling quickly is in regards to the unlined pots. The ones that are lined with stainless remain hot for a long time and that needs to be taken into consideration when cooking. I bought most of my copper pots on a trip to France about 18 years ago. One pot came from Germany when we lived there in the late '80s early 90s - lovely memories every time I use them. Thanks Robert, for the good info! Do you know where to get copper pots retinned? This question was one of the first I asked on the old foodpickle (the prior name of the Hotline), while it was still in beta. Nice article - I appreciate all the cleaning tips! Droplet's mention that copper does not hold heat is an important note; because it is an excellent conductor, it heat very evenly, quickly, and the moment you remove it from the heat, it cools, which gives you good control over delicate items like caramelizing sugar, and cooking eggs, fish, fruit... It would be great to chat a little too about unlined copper, it's benefits and how to use it safely - sugar pots, meringue bowls, preserving pans and the like :) Cheers! Very good points Bella! I could never see a traditional copper mixing bowl lined with tin as its excellent and safe to use unlined and same with a sugar pan! I would love to chat about this because its a stigma copper has gotten over time and the items you mentioned are normally used unlined.. I especially like to use my preserve pan as a serving piece to serve a side dish when have a dinner party! Thanks Bella! Cook's Illustrated had a succinct piece on copper years ago. Here is an excerpt of the article, particular to unlined copper uses: "With regard to sugar syrups, confectionery and cookware industry experts agree that copper’s outstanding heat conductivity and quick reaction to temperature changes offers precise control over the different stages of sugar syrup, caramel, and chocolate preparation. Copper’s speedy distribution of heat is also considered an advantage when making jam and preserves because the fruit and sugar reach the desired consistency quickly, before the fruit loses its natural color and fresh flavor." I think the key things to remember when using unlined copper are: have a good reason to use unlined (the reactivity of the copper to your ingredients i.e., egg proteins pick up copper ions while you whip, strengthening their bonding; and quick heat control i.e., caramelizing sugar perfectly) and make sure the copper is extremely clean before you use it. I detail my pots with lemon and salt, and rinse and dry thoroughly just before cooking so there is no tarnish on the cooking surfaces. I only have one lined piece - an 8" Mauviel saute pan which I love for eggs, fish, scallops and the like. I use a preserve pot I found in France all the time (J.Pouteau is the mark - very pretty, very heavy, hammered piece. I have been wary of dovetailing as I thought the seam might eventually come apart, but I notice you are a fan and it is gorgeous). I also use a sugar pot for ganaches, caramels, etc. So, ha, I am certainly a fan! And I love your site, Beth Ann - so appreciate your pursuit of your copper passion! 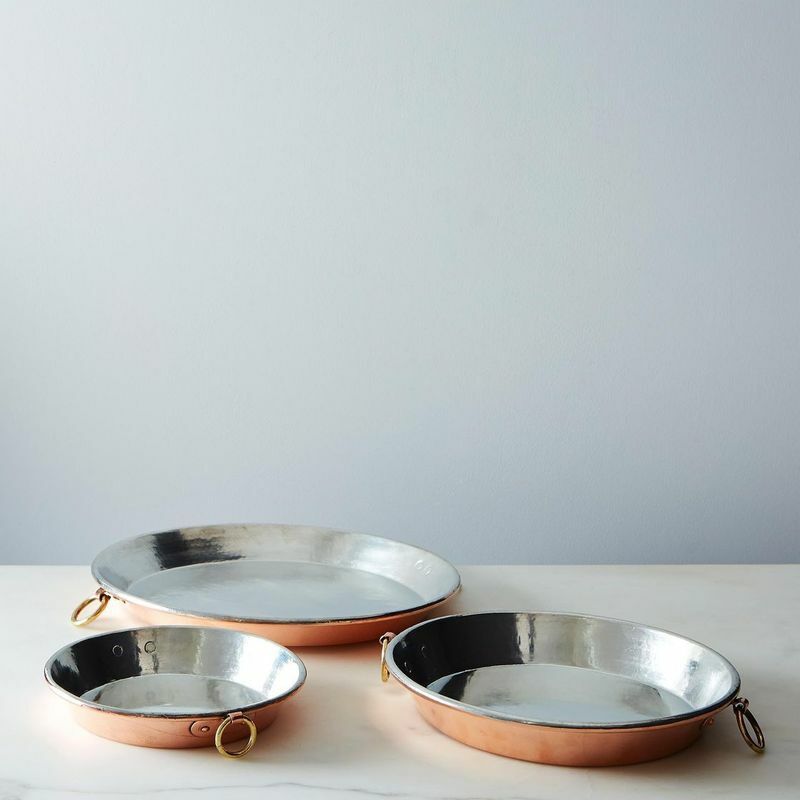 We love our copper pans, and these tips for shining are great. However, we need to have two of them re-tinned on the inside. Can you talk about that a little? Are there any go to sources that we can send them too? THANKS! This is a excellent link! Thanks for sharing!Yes all the information is spot on! If you see any copper showing through your tin you may want to consider re tinning for safety. Glad you love your copper pans!! I've had good luck sending mine to East Coast Tinning. See: http://www.eastcoasttinning.com. Very nice work, and a fairly quick return in the post. Copper isn't right for everything. It should not be compared to steel or cast iron because it does a very different job. I would never use a copper pot for a slow stew, that's where cast iron shines. On the other hand, when cooking a piece of fish au point, copper is in its element. As far as cleaning is concerned, sorry for the detour, I don't really worry about it. My copper is old, stained and bashed about and that's the way I like it. Every now and then I scrub it with soap and water, but it would never occur to me to polish it. Andreas thank you for your fun comment! Beside my business I own a little collection for my own personal use and I too keep it looking used because I cook with them so much. Because of their origin and character polished or not they always look beautiful and always serve their function for me. Glad to hear you use yours! There's something deeply pleasurable, at least to me, about cooking with an old copper pot. I make porridge for my family every morning that way. A great way to start the day. YES indeed! Or lately I have been making hot chocolate for my son in my mini pot bellied saucepan. I used my pie tart two weekends ago to make a apple pie it worked brilliantly . I have one fairly blackened pan that i have tried to get back to its original shine for a long time. It's blackened on the inside and the outside. Is it a lost cause? or just a matter of time and elbow grease before it is restored? I'm worrried that constant rubbing on the tin with Twinkle or Bar Keeper's friend is going to render the inside unusable (unless I get it re-tinned). I've only used the Twinkle and BKF so far. I don't need to use a homemade methos to clean it. The black stuff just doesn't want to come off. I think heat it the main reason it's discolored. I'm more concerned about the inside of the pan than the out side. I have other copper pans, and i definitely don't want to create this problem for myself again. What is a good daily cleaner that is gentle as well? I use them all the time. With copper try not to heat empty as this will cause that discoloration whether you pre heat or leave it sitting on a flame empty. Have you tried a piece of wool (from hardware store) and scrub with detergent? Glad to hear you are getting good use with them! Have you tried baking soda (2T-1c water) simmered? Might help a bit. Tin is so soft, it's easy to damage with enthusiastic cleaning as I am sure you know. I think it's the nature of the beast to look well used - as it should be. Try simmering baking soda in water (2T -1c) might help a bit. But it's the nature of the beast to look well used - as it should be. These pieces are beautiful! Hard to find cookware like this anymore..